Engine Components / CAD Dwgs. About this Site This site is devoted to the History and Restoration of the Barker Midget and Sports Car Racing Engine. 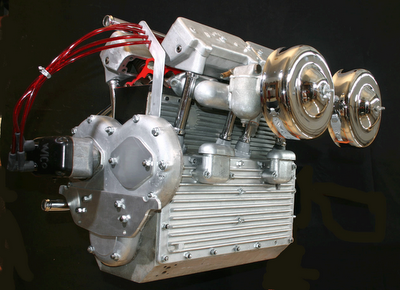 The Engine was created, designed, and built by Robert (Bob) Roy Barker (b. 1918 - d. 1951) a race car driver and engineer (self made) originally from Houston, Texas. Prior to WW II the Barker family moved to Burbank, California where Bob found work at Lockheed Aircraft Company. It was here that he learned and fined tuned his technical knowledge. After the War, Open Wheel and Midget racing was again established on the West Coast and Bob was back in a race car. ( his wife wanted a sofa for their new living room - he wanted a drafting table. He got the table) and began to design the Barker Engine. He had no formal training in engineering, drafting, or machine work. But he was a natural. Unfortunately, none of his drawings remain today so we are generating CAD Drawings of each and every part as we restore them. Baumbach,and others, plus a variety of suppliers (cams from Isky) he turned out six complete engines. They did well in competition and were a threat to the Offies. One weakness seemed to be the rocker arms. And, as with any new engine, one can expect a few bugs. Unfortunately Bob did not have the time to fine tune his exceptional engines. On November 11, 1951, he along with race driver Ronald "Mack" Hellings, photographer George Lee Harvey, and the pilot, crashed in their private plane in the Tehachapi mountains near Gorman, California, on their way to a race at Bay Meadows Track in San Mateo, CA . Bob Barkers demise, as well as the others, was a tragic loss. Based on what he had accomplished in his short life time, one can only imagine what other unique and original projects he would have developed. This Web Page and project is a tribute to Robert Roy Barker: One of a Kind. Click on "Slideshow" for Bob Barker racing activities. For engine specifications see "Motor Trend" article written by Bob Barker in 1949. Engine Components and latest CAD Drawing. Bob Barker envisioned building a Sports Car to test his engine in and make it available to sports car racing enthusiasts. It was left to Ernie McAfee to make that happen. Barry Knowlton (b.1931 - d. 2005) was responsible for rescuing most of the remaining Barker Engines. See article about him.